Where others see household items, Peter Kokis sees robot parts. That's because Kokis builds costumes based on famous robots. 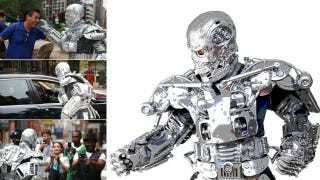 Above, his T-800 endoskeleton from Terminator. The costume weighs 120 pounds and took Kokis around 300 hours to construct, sourcing parts from "ordinary and readily-available household, hardware, and sporting goods items...stuff we all have in our kitchens, bathrooms, closets, and junk drawers." According to him, many of the costume's parts are from the bathroom and are "toilet-related". Seriously. Check out his T-800 costume as well as his Transformer outfits.